Blue Falls Manufacturing builds hot tubs for the Arctic Spas and Coyote Spas brands in Edmonton, Alberta, Canada, where the temperature rarely exceeds 0°C from mid-November to mid-March. Not surprisingly, all aspects of their marketing, including the brand name and the polar bear logo, focus on cold temperatures and thermal insulation. 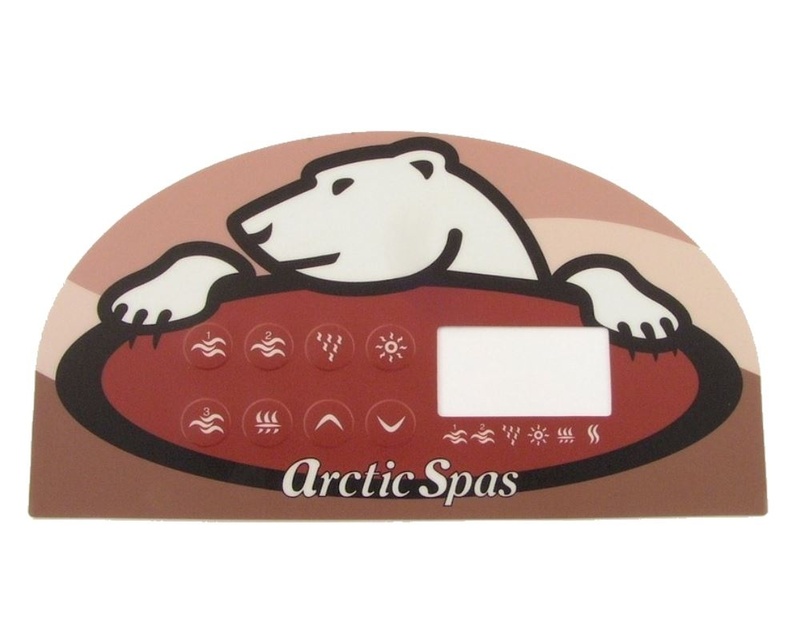 Arctic Spas is also one of the first manufacturers in North America to use Chinese components. One of the founders of Arctic Spas, we were told, was also an investor in Rising Dragon, and Arctic adopted the brand's sealing parts (jets, valves, skimmers and projectors, among others) in 2009. Arctic Spas has also developed its own control systems under the name of Global Spa Components, and has been using them since about 2011. Previously, Gecko brand cases were used in Arctic and Coyote spas. Arctic Spas hot tubs are often plumbed with translucent flexible tubing, called"Torsional Reflex Hose" n their marketing, which is not standard size in the spa industry. They connect this pipe to standard parts by pushing in a rigid 2 inches piece of pipe at each end, with a lot of red glue. The filters used by Arctic Spas are: RD50, PRB50, PRB25, RD35, 40372, PWW10, Silver Sentinel RD50 or Silver Sentinel PWW50. Pumps and blowers: Waterway Executive two-speed, sometimes including the version with the US Motor. A 94 mm suction screw pitch is very often seen on Arctic Spas pumps. Some spas are also equipped with the Waterway Executive single-speed, Aquaflo XP2e two-speed and single-speed. Laing E14 circulation pump: If you need to replace the blower in your Arctic Spas or Coyote spa, we recommend the Ultra 9000. Jets: Spas manufactured since 2009 use the brand's Rising Dragon jets, including theOrca at the foot level. If your spa was manufactured between 2009 and 2011, it may have old clip-on nozzles, in which case you will need adapters (small and large) to attach the new screw jets. Spas manufactured up to 2009 are normally equipped with Waterway's "Storm" series clip-on nozzles:Cluster Storm, Mini Storm, Poly Storm and Power Storm. Arctic also installed large Waterway Whirlpool jets (adjustable or non-adjustable) at the feet. Valves: Arctic used to use Waterway valves in the past, and switched to the Rising Dragon brand. Some of their valves are equipped with special bear paw handles, including one for the bypass valve, and one for waterfall valves. Other parts: classic headrest, or with the bears and with telescopic arms (the bracket for the latter is also available). Projector 230 mm, Torsional Reflex Hose, Holder for cover lift, Holder for cup.